This spacious south-west facing house is situated in just under 1 acre of terraced hillside garden, once the ancient olive groves that surrounded the pretty medieval hilltop village of Callian, just 10 mins walk from the house. The views look south some 25km to the Massif de Esterel and Massif des Maures, the mountain ranges bordering the Mediterranean towns and beaches of St Raphael, Fréjus, St Maxime and St Tropez. Beaches can be reached in about 45 mins. Callian itself is small and charming but nevertheless boasts all the basic necessities, and down in the plain below the village all the usual shops are represented. Nice, Cannes and Antibes are within 45 minutes by car with all their well-known attractions including the Picasso and Matisse museums, and Renoir's house. One popular visit is to Grasse, 25km away, with its perfume distilleries and Fragonard museum. Locally there are plenty of excellent places to eat out ranging from pizzerias to Michelin star restaurants. Bathroom 1 with bath and shower, basin and wc. Bathroom 2 with bath and shower, basin, bidet and wc. Bathroom 3 (en-suite to bedroom 3) with bath, basin, separate shower, wc. Bathroom 4 with shower, basin and wc. Separate wc. Sitting room 1 with open log fire and dining area, Hi-Fi, French windows to terrace. Mezzanine with large table and office area. Wireless broadband internet connection. Britannia twin oven electric "range" with six induction ceramic hobs and extractor fan. Rotisserie in right hand oven. There is plentiful supply of plates, glasses (including champagne glasses), cutlery and a large selection of cooking utensils. Just like being at home. Outside dining area under terrace roof and large indoor dining table, both seats 8. In winter there is superb skiing at Isola 2000 and Auron only 2 hours by car. This is a spacious villa with spectacular views towards the Mediterranean and a secluded private pool. Sleeps 8 in 4 bedrooms with 3 bathrooms and a shower room. The villa is set in a mature one acre hillside garden with lawn, shrubs and trees including olives and palm trees. It is only a ten minute walk to the charming medieval hill-top village of Callian which boasts all the basic necessities: two restaurants, cafe, butcher, baker, chemist, Casino mini-market (selling food, drink, household supplies and English newspapers) and a beautiful historic church. Down in the plain below the village there is a large variety of shops including a number of well- stocked supermarkets and a farmers market. There are a large number of restaurants in the locality ranging from establishments with Michelin stars, restaurants providing excellent French and international cuisine to pizzerias. Across the valley there are two internationally acclaimed 18 hole golf courses at Terre Blanche and gliding at Fayence. Nearby at Lac de St Cassien there is swimming and pedalos can be hired. Nice airport is 45 minutes by car. We immediately fell in love with this wonderful and extremely spacious villa - although we were a group of five there is plenty of room for eight with peace and privacy for all. It is beautifully furnished with interesting antique pieces, oriental carpets, pretty cushions etc, and there are lovely paintings by the owner In every room . The smart and very well-equipped kitchen opens onto a superb, shady dining terrace, with views stretching for miles - the setting for many convivial meals. Many happy hours were spent by the super pool, set amongst pretty gardens, which are carefully maintained and full of flowers. Callian is a charming, low key, 'perched' village, with alleys to explore, a choice of restaurants, a good butcher and baker - a pleasant 10 minute walk away for your morning croissants. Five minutes by car to supermarkets and a useful daily farmers' market. A privilege to stay here: our adult family group had a marvellous, relaxing week and we recommend this exceptional villa without hesitation. It was a great pleasure having you to stay. Come again soon. We had a wonderful time at Callian. We were expecting the house to be lovely, but it was even better than we imagined and bigger than I had realised. We had chosen a four bedroom house as my 3 children need a bit of space from one another to keep harmony, but we felt we could almost fit another family in and still not feel on top of one another! It is a real family home with lovely furnishings and and lots of the owner's colourful paintings decorating the rooms. The house is about 10 mins walk from the centre of the village which is a small very pretty 'perched' village with tiny winding alleys at the heart of it, and a handful of good restaurants. 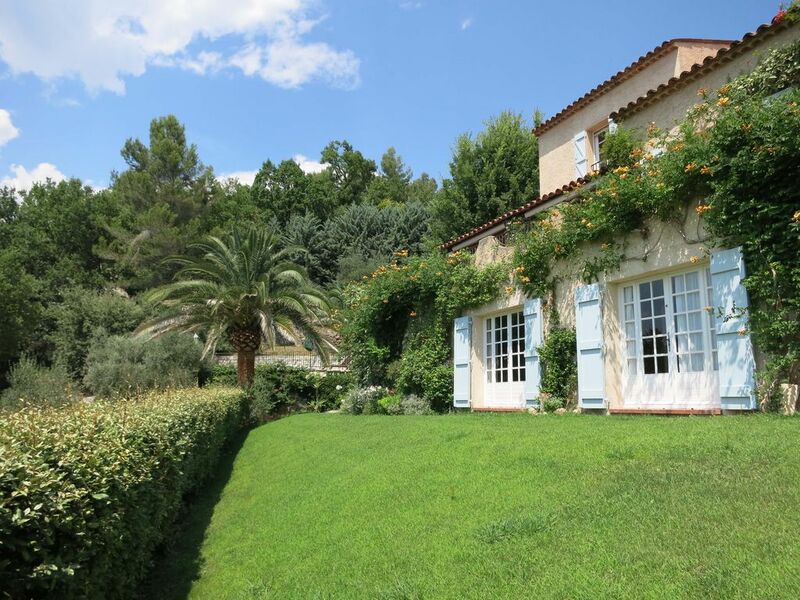 Although it's up in the hills, it's 5 mins in the car down to the main road on the plain where there are a good choice of supermarkets, and road links to other places to visit such as Cannes and Grasse. We felt very privileged to be allowed to stay in such a lovely house! We loved having this marvellous family as guests. We hope they will come again. The Mediterranean beaches at Cannes, Frejus and St Raphael can be reached in about 45 minutes by car. By air: Nice - Cote d'Azur (45 minutes by car to Callian). Services by Easyjet (Gatwick, Luton, Stanstead, Liverpool) British Airways. Car hire at Nice airport. By car: Calais, A26 (Reims), A5, A31 (Beaune), A6 (Lyons), A7 (Aix-en-Provence), A8 (exit 39 Les Adrets – Lac de St. Cassien) 15km to Callian, approximately 1200km (750 miles) from Calais. By train: Eurostar, St Pancras – Paris/Paris – Frejus/St. Rafael. Nearby there is swimming, windsurfing and canoeing on the extensive Lac de St Cassien, and gliding at Fayence. The mountainous terrain to the north provides plenty of opportunity for walkers, including the Grand Canyon du Verdon. Locally there is tennis and horse-riding. Callian offers all the basic necessities: 2 bars, butcher, baker, grocer (also sells local wines) and newsagent, chemist, church and 2/3 restaurants depending on season. Down in the plain below the village all the usual shops are available, including 2 well stocked supermarkets.